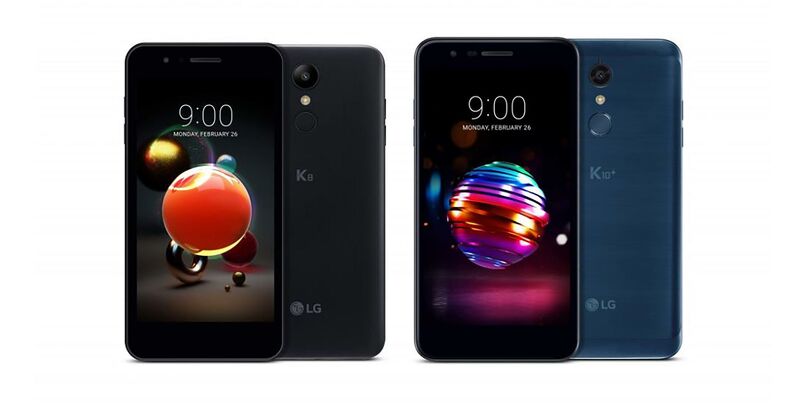 LG has officially unveiled the K8 and K10, two new smartphones from the company that will make an appearance at Mobile World Congress. According to LG, the two phones sport advance camera features such as high-speed autofocus and noise reduction for better low-light photos. The K10 uses a 13-megapixel rear camera and an 8-megapixel selfie shooter with bokeh capabilities. The rear-facing fingerprint sensor also triggers the device’s quick shutter, allowing users to snap photos quickly. Meanwhile, the K8 features a rear-facing 8-megapixel camera and a 5-megapixel selfie shooter. LG claims both phones also take clearer photographs in dim environments with their included ‘Low Light Noise Reduction’ functionality. Similarly, both the K8 and K10 include a ‘Flash Jump Shot’ feature, which snaps a photo every three seconds then stitches them together to create a GIF. The functionality is available when using both the front- and rear-facing cameras. The K10 and K8 will ship in ‘+’ and an ‘α’ models. With both the K8 and K10, the ‘+’ model features better specs than the standard and ‘α’ variants. Notably, however, neither device will ship with Android Oreo. It’s unlikely either of the phones will come to Canada. In its press release, LG lists Europe, Asia, Latin America and the Middle East as release markets for the K10 and K8, with no mention of North American. We reached have reached out to LG Canada, just in case, however. In other LG news the company is working on a new flagship phone with the codename Judy, according to prolific leaker Evan Blass.